DISPLAY HOME OPEN DAILY! Conveniently located in Chesterfield, right off Olive Blvd. 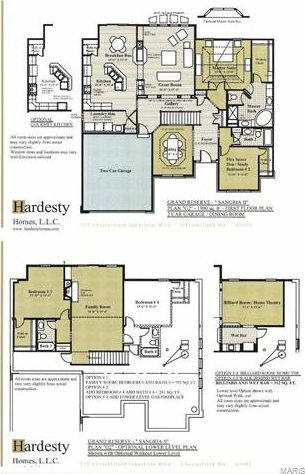 is Hardesty Homes' newest community, Grand Reserve. The Sangria Model - to be built. 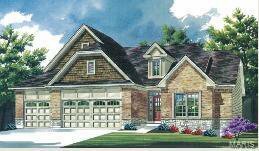 3 car garage, Flex space design, Open center island kitchen with walk-in pantry. This luxury community features our very popular single family home. 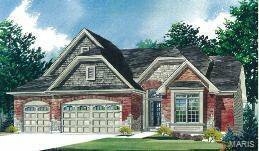 • Manageably sized homesites • Three-car garage available on selected lots • Luxuriously appointed. Standards included in every home: 9' ceilings (some are 11') 9' basement pour, wood floors in Kitchen, breakfast rm, great rm & foyer, 42" maple wall cabinets, granite countertops, 5 1/4" base-boards, Landscape package, in-ground sprinkler system, 42" gas direct vent fireplace and much more! Open design with large kitchen. Customize this home with a covered, screened porch. You can also finish the lower level with a custom look. Main floor master bedroom is equipped with elegant master bath and huge walk-in closet. Customization is welcomed. Base price.